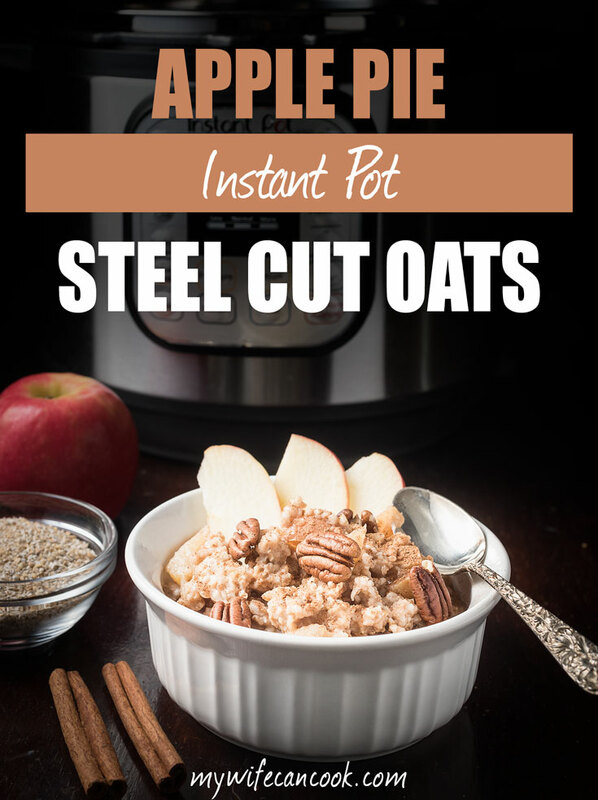 Our love for Instant Pot recipes continues with these Apple Pie Instant Pot Steel Cut Oats. They’re easy to make, they make the perfect hearty snack and our son just ate two bowlfuls! Fall is one of my favorite seasons. The cooler weather and leaves changing are hard to beat. And then there’s soup and apple season! This time of year we love making apple crisp and large batches of homemade applesauce. 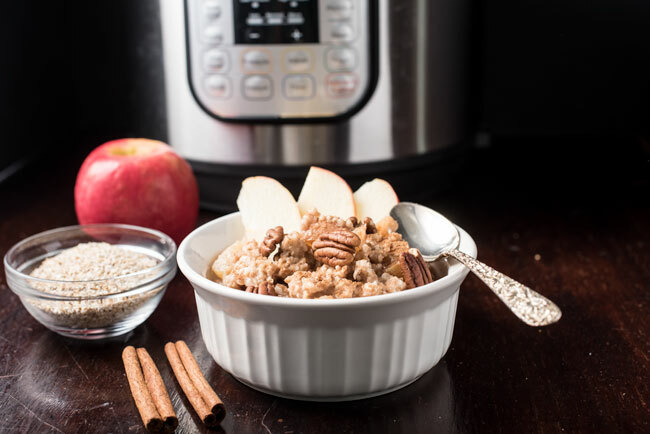 We also love drinking hot chai-spiced apple cider and we’ve now added these Instant Pot Steel Cut Oats into our repetoire . I tend to buy individual spices rather than spice mixes. Apple pie spice mix is a popular mix this time of year, but I’d rather have the spices separate so I can make pumpkin spice or just have plain cinnamon. 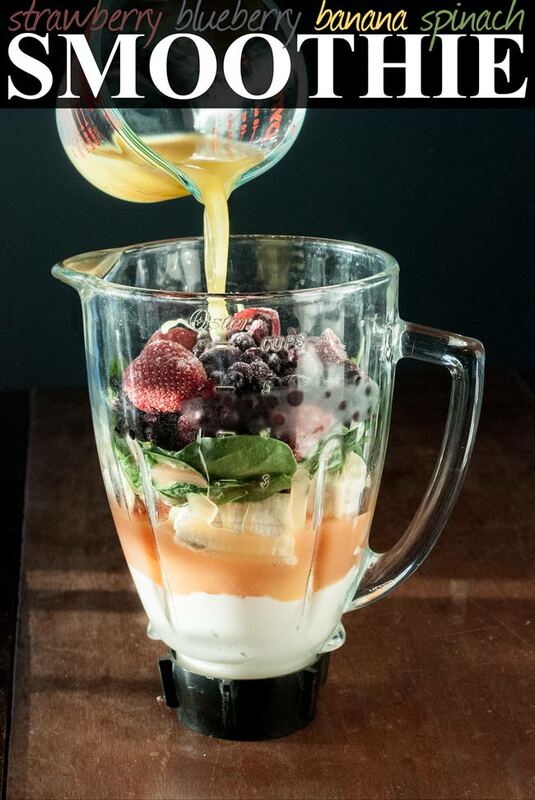 Plus, you can mix up your own and customize the amounts. Most apple pie spice mixes I found online include cinnamon, nutmeg, and allspice with some including ground ginger, cardamom, or cloves. I personally am not always a fan of cardamom, so I do like the idea of customizing. If you are looking for a recipe, I usually mix up this apple pie spice mix from Home in the Finger Lakes. Partly because it has the spices I like, and partly because I grew up in the Finger Lakes. During one of my pregnancies, I craved sweets in the morning. I can remember going to the OB’s office after eating apple crisp for breakfast. Needless to say, my sugar levels were way too high and I had to admit what I had eaten for breakfast. What can I say, this was after months of being disgusted by food and having “morning” sickness all day long. I made an effort to eat some protein in the morning and skip any high sugar items. If only I had had this recipe then because it is very similar in taste to apple crisp and apple pie without all the butter and sugar. Yum! There are a lot of different kinds of oats out there so it took some thinking before landing on Instant Pot Steel Cut Oats. I know that overnight oats are really popular now, and I do like some of the versions. But, I still prefer hot oats. There are a lot of overnight slow cooker oatmeal recipes that you can make right before going to bed and devour in the morning. Plus, there’s the added bonus of the house smelling delicious. However, once I tried an Instant Pot oatmeal, I was hooked. I can wake up in the morning, come down, throw the ingredients all in the Instant Pot, turn it on, and make my coffee. While waiting for the coffee, I frequently take the dog out, throw in a load of laundry, empty the dishwasher, or do a few other quick tasks to get the ball rolling for the day. Ideally, no kids would get up before this, but it doesn’t always work out that way. Then, soon after the coffee is ready, the oats are done. I can grab a bowl and enjoy a few minutes of peace and quiet. I only used one apple, but I think a second would be perfect–my son even requested more apple in it next time. 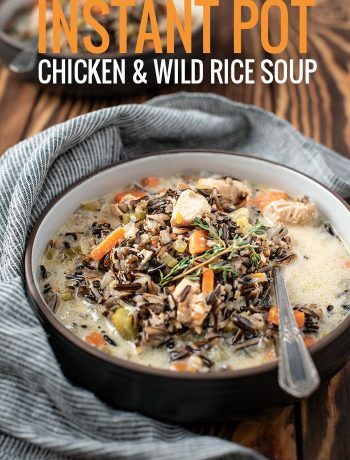 I used quick cooking steel cut oats in this recipe, using a 3:1 ration of water to oats. I think regular oats would work as well, I just need to test out the right ratio of water to oats. This batch was enough to feel 4-6 people depending on how large a serving. 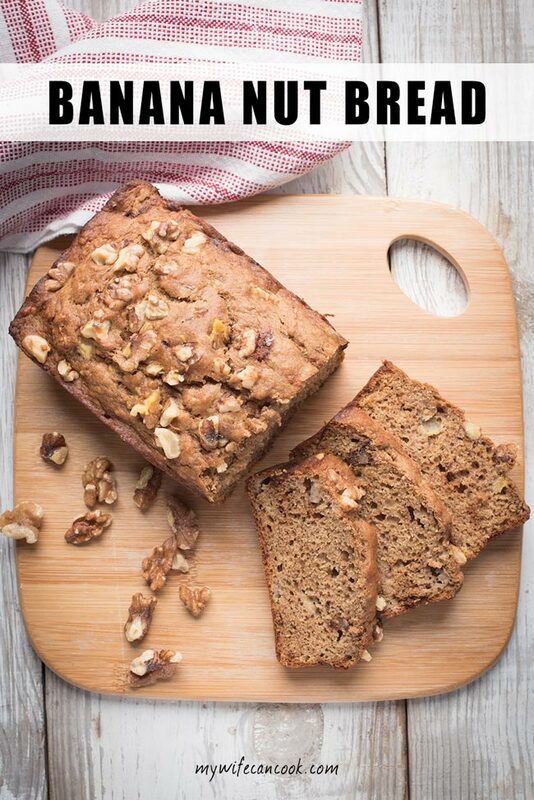 You can easily cut it in half if you are feeding less, however, if you increase the quantities, be sure not to fill your Instant Pot more than half way with water and oats as they get rather foamy while cooking. I cooked the oats for 5 minutes on manual and then let naturally release for 10 minutes. The first time I made this, I forgot to turn off the pot after the cycle–it automatically stays on “keep warm.” I found that the oats stuck a little to the bottom, but came off easily if I quickly removed the inner pot from the Instant Pot housing and stirred with a rubber spatula. Ideally, I think you should turn it off. 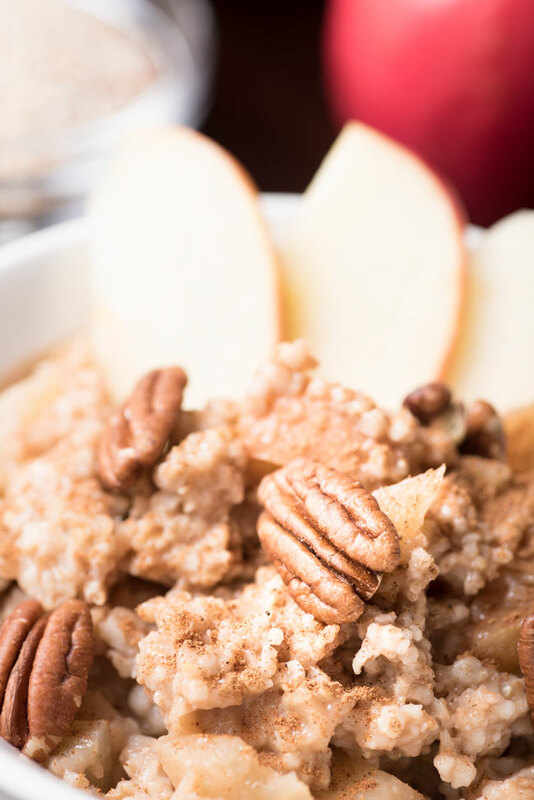 As far as topping your oatmeal, I like to add almond milk (my kids prefer regular milk), a small handful of toasted pecans, and a small spoonful or brown sugar or maple syrup. 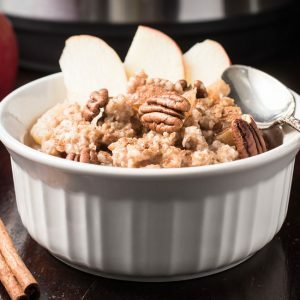 I will definitely be trying more oatmeal recipes in our Instant Pot and love all these ideas for sweet and savory oatmeal recipes. 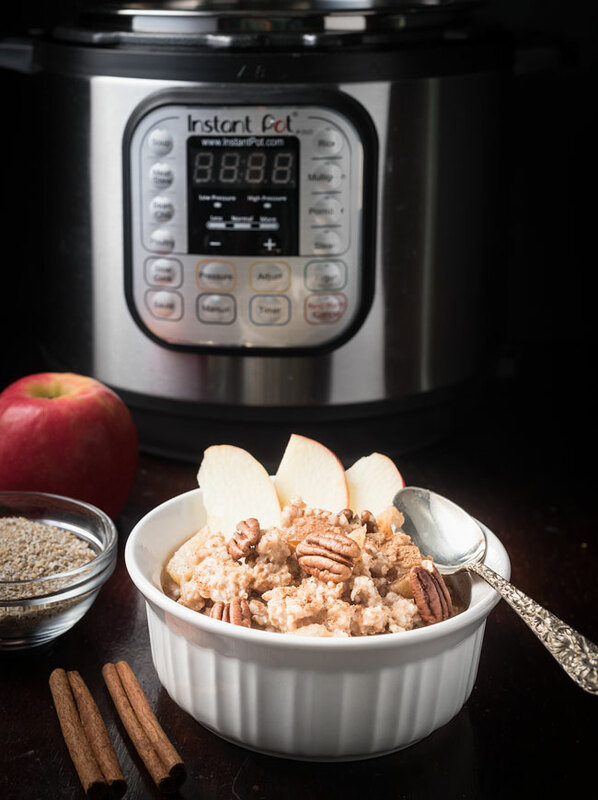 Oatmeal made in the Instant Pot with apples, apple pie spices, and steel cut oats. Close lid, switch vent to sealed, press manual, and toggle to 5 minutes. When cycle ends, turn off, and let pressure naturally release for 10 mintues, then quick release. Stir and remove pot from Instant Pot housing. Serve with your favorite toppings--we added a few pecans, a little almond milk, and a drizzle of maple syrup for sweetening. Maybe add a little more water? I definitely have had a small amount of sticking occassionally, but when I added almond milk after opening the lid, it easily stirred up and “deglazed” the bottom. If you make this PIP, you won’t have a sticking problem. I made it in my 5 cup Pyrex Measuring cup and added an additional 5 minutes cook time (to account for the container). No sticking and done to perfection.